American Wolf: A Bullet from the Back of a Bush. 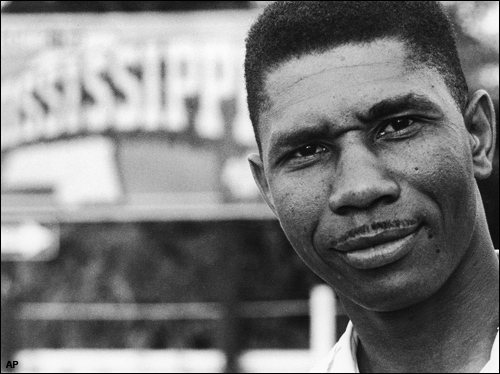 50 years ago today, a bullet from the back of a bush took Medgar Evers' blood. Although Evers is only dimly remembered compared to his contemporaries like Martin Luther King, Jr., & Malcolm X, he was well-known in his time as a Civil Rights leader & NAACP field secretary (the first in Mississippi) who fought to overturn segregation in the University of Mississippi. But it was the desegregation of another college that led to the circumstances of Evers' death. On June 11, 1963, President John F. Kennedy sent the National Guard to protect two African American students who had enrolled in the University of Alabama. That evening, Kennedy made a national address that marked a turning point in Civil Rights. "We preach freedom around the world, & we mean it, & we cherish our freedom here at home;" Kennedy said, "but are we to say to the world, &, much more importantly, for each other, that this is a land of the free except for the Negroes; that we have no second-class citizens except Negroes; that we have no class or caste system, no ghettos, no master race, except with respect to Negroes?" In the early morning hours following the speech on June 12, 1963, Evers was returning to his home in Jackson, Mississippi, after meeting with NAACP lawyers. In his hands were a stack of NAACP T-shirts that said "Jim Crow Must Go." A bullet was fired from an Enfield 1917 rifle, hitting him in the back, & ricocheting into his house. Evers staggered a few feet & collapsed on his front lawn. He was taken to a local hospital & died within an hour, less than a month before his 38th birthday. Like Joe Hill or John Brown, Medgar Evers' death was immortalized in many gestures large & small--the Life cover story about his funeral; a key plot point in the smash film & book The Help; even in an episode of the '70s sitcom Good Times, when some FBI agents visit the Walker home & are asked by young activist Michael who killed Medgar Evers to the audience's applause ("We're working on it," is the FBI agent's answer, to the audience's laughter). But as a matter of fact, someone had been tried for Evers' death--fertilizer salesman & member of the White Citizens' Council (& later the Ku Klux Klan)--Byron De La Beckwith, although two mostly-white juries resulted in deadlocked verdicts. Three decades later, new evidence emerged (not the least of which was De La Beckwith's own bragging in the years between), & he was found guilty in early 1994. De La Beckwith tried unsuccessfully to appeal & would die in jail at the age of 80 in early 2001. All of which is interesting & telling, but fails to bring us closer to Medgar Evers, the person. Perhaps because he died so early & so young, Evers remains elusive in a way that both King & Malcolm feel more complete--as I unintentially demonstrated above, in talking about Evers we often end up talking around him (his times) than talking about him (his life). Dylan's "Only a Pawn in Their Game" is perhaps the ultimate tribute to Evers because it is the ultimate statement around him (as opposed to about him). Evers is the inspiration, framing the song like a Greek epic, but disappearing in the middle three verses that examine the social scenario that led him to be shot in the first place. As a work of economy & complexity, it is a masterpiece; for my money, Dylan never wrote a better song in his early folk period. It is less about one man's murder as it is the entire social structure that led to that murder, a staggering undertaking pulled off in a mere five verses. In its own way, the song is as much about Medgar Evers as it is about Byron De La Beckwith, & system that manipulated him into becoming a murderer in the first place. There comes from the narrative something like sympathy for De La Beckwith's position, but in the end it is just cold rationale. The song ties Evers & De La Beckwith together in a gesture of good & evil, famous & infamous, black & white--&, if there's any doubt as to where the singer's sympathies ultimately lie--King & Pawn.